It’s all about balance. 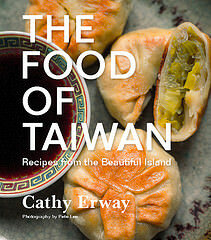 Sweet and savory; healthy and buttery; light and fluffy, and somewhat dense and gritty. That’s what good cornbread is all about. You could see it as a series of contradictions, of too many conflicting elements trying to work together at once. Or you could try to keep it all in check, to each his own place in this small casserole dish, a miniature world that’s really not that hard to govern over, when you think about it. Making food is empowering; you have complete reign over this little thing. 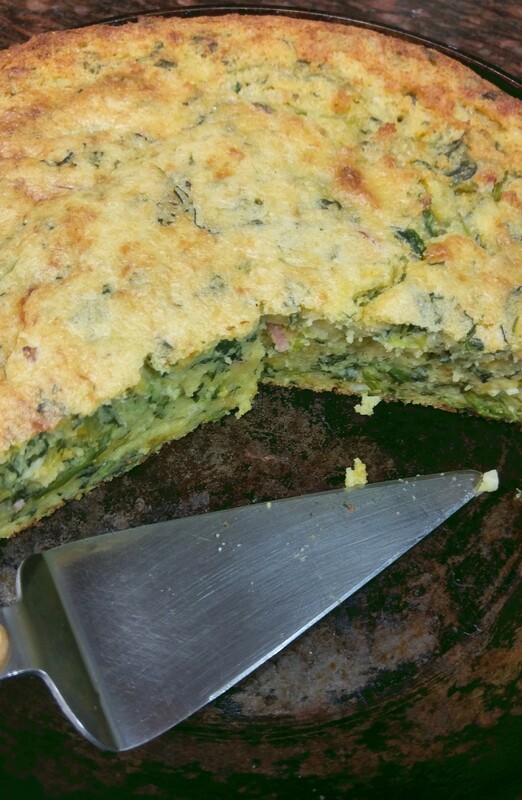 But still, when I considered adding some spinach that I had mountains of in the fridge (wilting quickly as the hours went by) to an otherwise classic cornbread, I thought, now that’s a rash use of power. 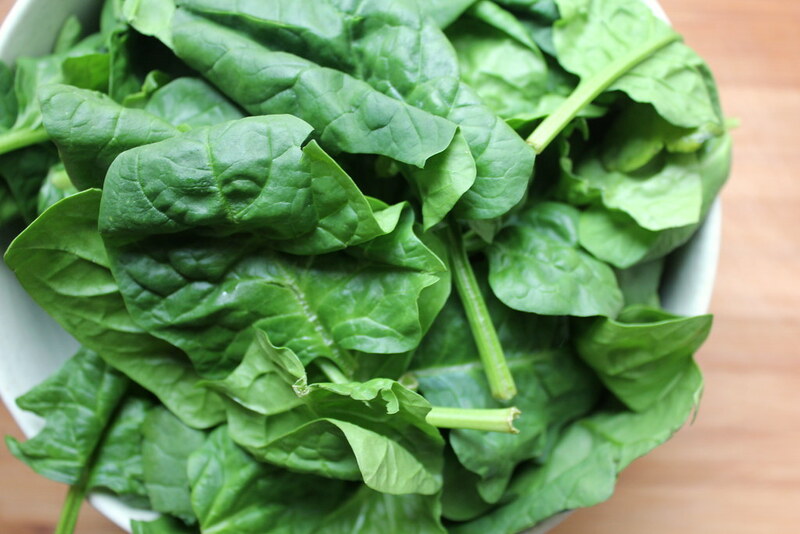 Spinach is weak-tasting and slightly mineral, although it might add pretty color contrast. I needed a bridge. Something to keep the balance intact; that bridge, I decided, would be grated cheddar cheese. This turned out to be a very handy and portable dish to bring to a holiday potluck. When Frank requested some extra eats at his party, he’d said specifically, “But don’t kill yourself over it.” Friends know when you have a propensity to overreact. For this party, Frank (a native Texan) also designated a theme of Southern fare and the dress code of “diamonds and denim.” I don’t know why. Fortunately, the Canadian suit is my go-to getup, and there were plastic baubles strewn about at the party to complete the look. As for cooking Southern comfort food classics, I’m not as well prepared. But I had recently been given a bag of stoneground cornmeal from some historic mill, and there was a recipe for “classic” cornbread on the package. This cornmeal looked pretty different from the classic yellow grit I have only seen cornbread made with — it had obviously a few different strains of corn in colors ranging from red to white. I was afraid it wouldn’t look the part of the classic Southern-style cornbread in the end for this reason, so I decided to take that up a notch with a few more ingredients instead. This particular cornbread recipe calls for stirring the cornmeal with warm water and butter a few minutes before beating in the rest of the ingredients. This creates a more custardy, moist end product, sort of like polenta. With the additional moisture and fat from the spinach and cheese, it became even more creamy. I sauteed the spinach along with some chopped shallots for sweetness until all the liquid had evaporated from the leaves, then cooled them down. They got a good chop afterward, before stirring into the batter. It looked like a quiche or frittata batter, only with distinct pebbles of stoneground cornmeal for texture. I’m not a fan of really sweet cornbread, so the sugar ratio was taken down a notch, although I prepared the pan with butter and sugar crystals to give it a crisped edge (and so the cornbread wouldn’t stick). Once at the party, it was so easy to cut neat cubes into the dish and pick up pieces of cornbread from it. They didn’t crumble apart at all. So here’s a dense, savory version of a (now not-so-classic) American favorite. Contradictory yet harmonious, sort of like diamonds and denim. Heat 1/2 tablespoon of the butter in a skillet over low heat and add the shallots and a pinch of salt. Cook, stirring occasionally, until softened, about 6 minutes. 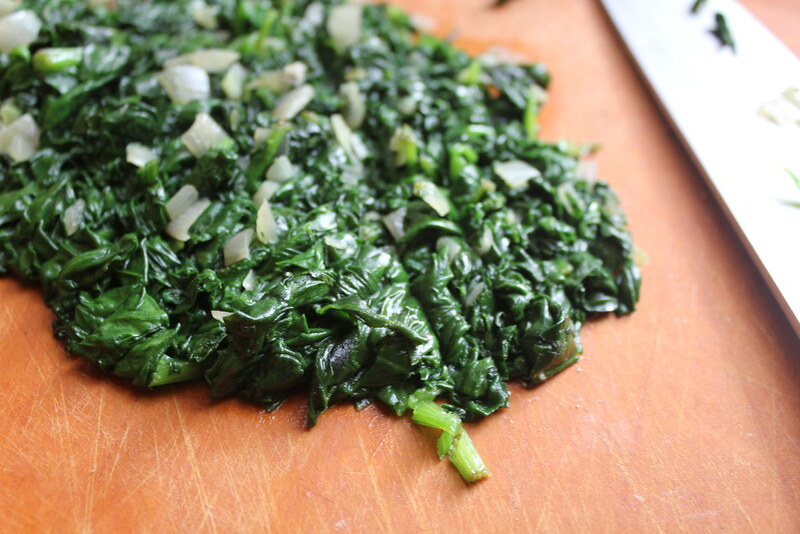 Stir in the spinach and a pinch of salt and increase heat to medium-high. Cook, stirring occasionally, until the spinach has released its juices and evaporated, so that the mixture appears fairly dry, about 5 minutes. Remove from heat and let cool completely. Once cool, finely chop the spinach mixture. Preheat oven to 400 degrees. Heat the water, milk, and the remaining butter in a saucepan over medium-high until the butter is almost melted. Stir in the cornmeal and continue stirring until there are no lumps and mixture is thickened, 1-2 minutes. Transfer to a mixing bowl, and stir in the chopped spinach mixture, sugar, salt, pepper, baking powder, beaten eggs, and finally, fold in the grated cheddar. 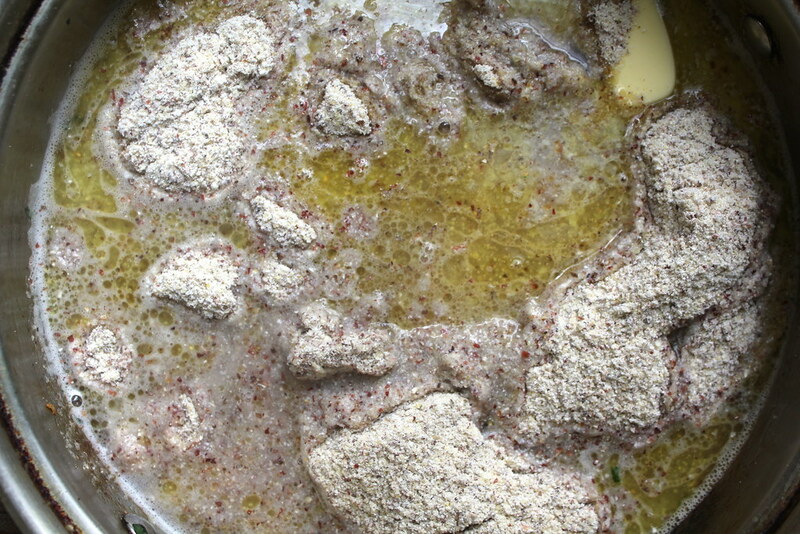 Grease a 9 x 9″ casserole with butter and dust the interior and sides thoroughly with sugar. Pour the batter into the pan. Bake for 35-45 minutes, or until top is lightly browned and a toothpick inserted into the center of the dish comes out clean. Let cool at least 5 minutes before cutting and serving. Six brownie points: For all the richness of butter and cheese, this side dish has a lot of health benefits going for it. 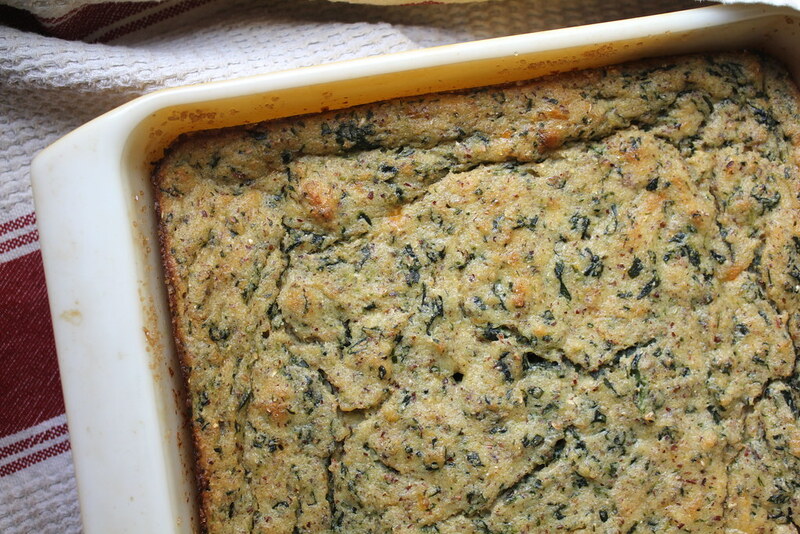 For one thing, it’s made with a whole-grain cornmeal (serendipitously gluten-free for those who are particular), has less sugar than most cake-like cornbreads, and it has spinach packed into it. So, you’ll get vitamins and minerals, and less energy-crashing effects. It’s also quite filling, and one small square no more than 2″ around was the perfect-sized party bite. 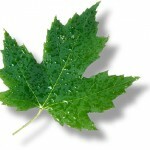 Eight maple leaves: Surprisingly, almost every ingredient can be sourced from local, responsible, and small-farm alternatives in this dish (aside from the salt and pepper). Even at the beginning of winter, we’ve got (sort of wilted-looking) spinach at the farmers markets, and certainly eggs, butter and cheese. 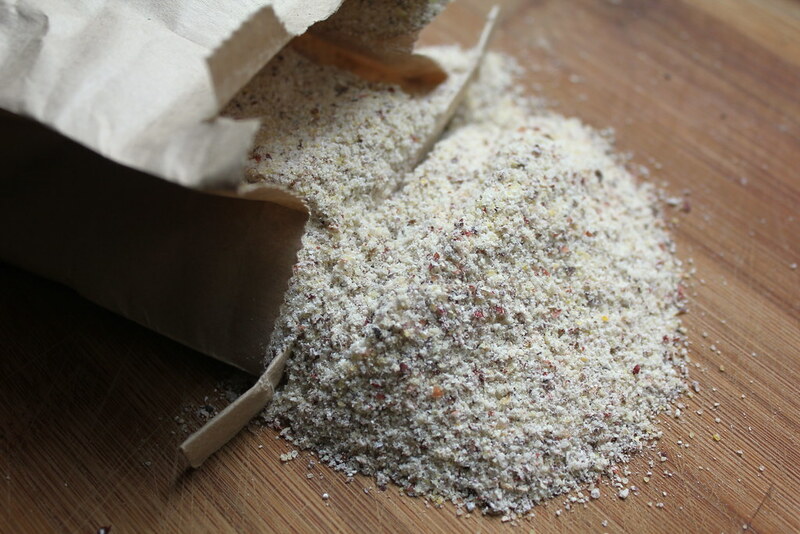 Look out for those farmstands toting cornmeal from ancient mills, too — I find the product to be hearty and flavorful compared to the factory-staple on grocery shelves. Oh, that sounds good. 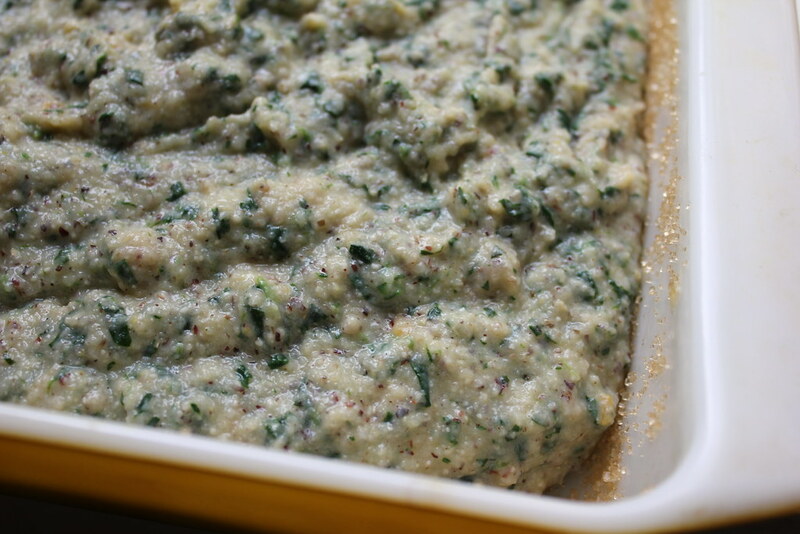 Yes, I can see the cheese making the spinach work – and it is all so pretty! I’ve done this with chard and feta and it tastes great. I just baked this the other week and it was DELICIOUS! I felt like it didn’t quite turn out right for me since it seemed super, super moist. I know there’s mention in the post about it coming out creamier but do you have thoughts on how to make it bake into a cakier consistency? @Sami: Sorry for the delayed response! It’s kind of a creamier style, because I was going off a recipe from the packet. Most cake-like cornbreads say that you just mix the cornmeal with your ingredients (egg, milk, etc.) rather than cook it in water first, so I would do that if you want a cakier result. Just skip the water and cooking step with the cornmeal and mix it all up!